The famous high-end watchmaking brand, Jeanrichard, has partnered with a contemporary street artist Gully for a very special project. The La Chaux-de-Fonds based Manufacture and the mysterious graffiti artist have joined their forces to host an exhibition on the theme of “Philosophy of Art,” which features not only Gully’s most recent works, but also three very special editions of Jeanrichard’s emblematic Terrascope model. The limited edition series of Jeanrichard Terrascope timepieces is dubbed Graphiscope, and it features 25 exclusive watches designed by the Gully himself. As explained by Bruno Grande, Managing Director of Jeanrichard, Gully, who is already a Friend of the Brand for some time, is the one that came up with the idea for the mutual collaboration. One day, while he was working on a new painting, he accidentally splashed the Terrascope he was wearing, and realized that it looks just amazing! Instantly, he came up with the idea for this avant-garde teamwork, which is a great example of creativity and freedom of expression. Three different watches, featured in the Graphiscope Collection, are rare and unique models, which are already considered true collector’s items. The three series are signed by Gully himself, and they consist of 25 pieces each. 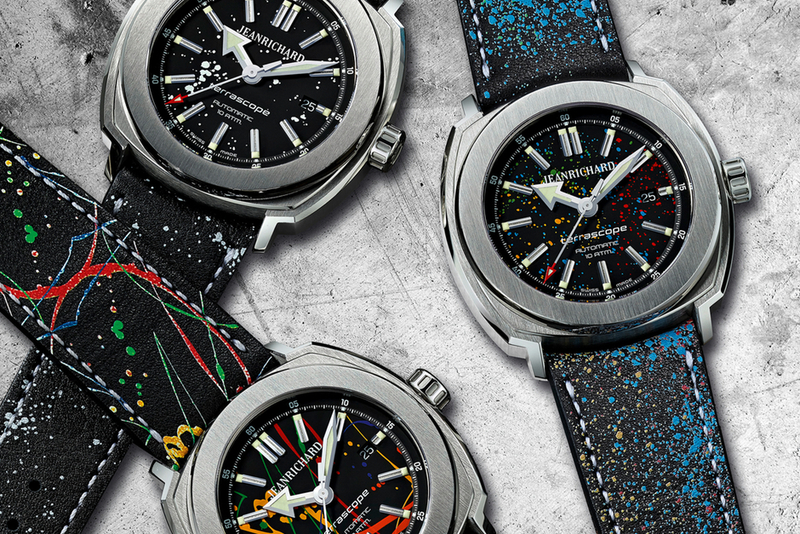 What makes them different from one another, and from the rest of the Terrascope collection as well, is the unique pattern of splashes and sprayings on their dials and bracelets. Three original variations of Jeanrichard’s Terrascope, forming the Graphiscope Collection, are crafted from stainless steel, and they come in Terrascope’s distinctive cushion-shaped case of 44mm in diameter. The multi-layered case features alternating brushed and polished finishes, accentuating the lively canvas of a dial. This time, Jeanrichard has chosen black dials and black straps as a backdrop for Gully’s vibrant dips and sprayings. The straps are made of genuine Barenia calfskin, and they are fastened to the wrist by steel folding buckles. Jeanrichard Graphiscope watches are powered by the self-winding mechanical movement JR60. The mechanism beats at 28,800 vibrations per hour and propels three luminescent hands and a date indicator. The JR60 is mounted on 26 jewels and it offers around 38 hours of autonomous work, while the solid case-back protects it from the ingress of water to up to 100 meters. The Jeanrichard Graphiscope Collection is currently on display at the exhibition “Philosophy of Art,” at Opera Gallery in Paris, France. The exhibition is open for public until October 11, 2014.